The Silver Center in Plymouth, site of the second of four DOE EIS Scoping Hearings for the proposed Northern Pass transmission project, was packed with some 600 people on Tuesday night. The crowd was overwhelmingly opposed to Northern Pass, with anti-NP speakers outnumbering the few pro-NP speakers six-to-one (48-8). As one wag put it, "the only thing Northern Pass had more of is lies." Five of the pro-NP speakers were from Franklin, NH. You can read the Union Leader's coverage by Dan Seufert here. Chris Jensen's NHPR report can be read and heard here. The Concord Monitor ran a couple of interesting op-ed pieces relevant to Northern Pass. Jan Edick's piece, "Is PSNH on the Wrong Side of History" can be read here, and Roy Stever's piece about Northern Pass's poor outreach effort can be read here. There's also a piece by IBEW member Tiler Eaton, who estimates that it would cost $2.4 billion to bury Northern Pass completely, compared to $1.4 billion for the proposed overhead option. So now we know the value of New Hampshire's landscape, and it seems like a bargain. 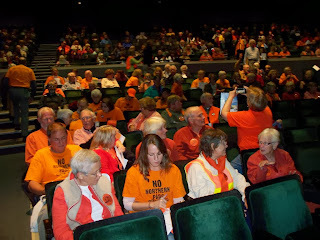 Some 600 packed the Silver Center in Plymouth, nearly all of whom opposed Northern Pass.